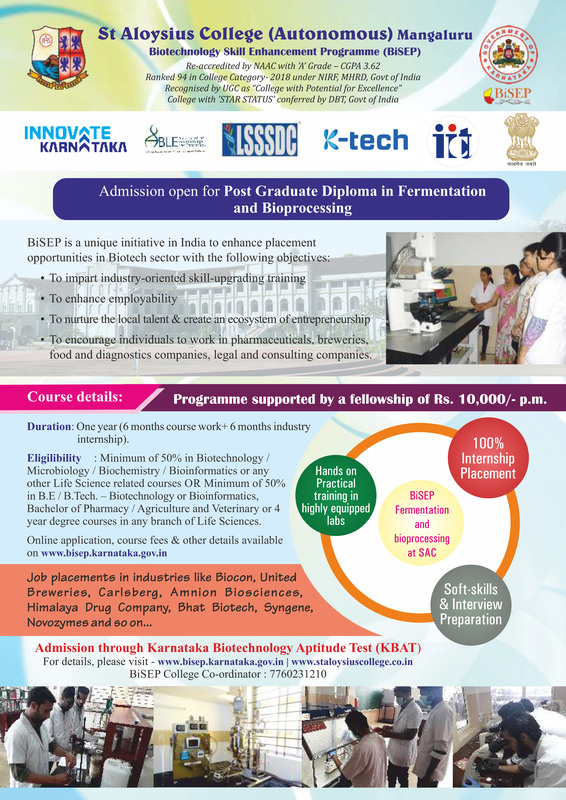 Biotechnology Finishing School (BTFS) is the novel initiative of Department of Biotechnology, Government of India, Department of IT & BT, Government of Karnataka in Collaboration with LSSSDC, CSIR-IICT and ABLE. This programme aims at imparting industry-specific skills thereby ensuring to meet the trained manpower needs of the Biotech industry. Having successfully completed the first phase of the Biotechnology Finishing School (BTFS; 2011-15) programme, The Dept of Post Graduate Studies and Research in Biotechnology, St Aloysius College Mangaluru has been selected for the second phase of the programme named as “Biotechnology Skill Enhancement Programme”. It is a one year Postgraduate Diploma Programme in Fermentation and Bioprocessing with 6 months coursework and 6 months Industry Internship. The selected candidates will be supported by a fellowship of Rs. 10,000/- pm. Furthermore, the centre has been accredited by Life Science Sector Skill Development Council, New Delhi as Vocational Training Partner for two Qualification Packs-Quality Control Biologist and Production/Manufacturing Biologist which are the main job roles inFood, Pharmaceutical, Biotechnology Industry and Clinical Research. The students will be trained on fermentation, upstream and downstream processing, production/manufacturing, quality control/quality assurance and facility management and applications of fermentation. In addition, regulatory requirements of different countries and CGMP requirements for the production area of biopharmaceuticals will also be covered. The trainees graduated for the past five years have 100% internship placement with over 80% job placements in industries like Biocon, United Breweries, Carlsberg, Intas Pharmaceuticals Ltd., Amnion Biosciences, Himalaya Drug Company, Bhat Biotech etc. The eligible candidate must have passed M.Sc. in Biotechnology/ Microbiology/ Biochemistry/ Bioinformatics or any other Life Science related courses or BE/ B.Tech (Biotech/ Bioinformatics) or B. Pharma/ B.Sc (Agri)/ B.Vsc. or any 4- year degree courses in Life Science and subjects with minimum 50% marks in the qualifying degree examination (40% for students belonging to SC/ST categories). 50% of the seats are reserved for Resident students of Karnataka. Reservations under OBCs/SC/ST and Hyderabad-Karnataka region are also provided. The last date to apply online is 7thAugust 2018. Please visit http://www.bisep.karnataka.gov.in for further details.